Sam was, by all accounts, a practical hands-on man whose grip had the grit of hard work. He started it all with little more than a barren field and some air in his pockets. Through hard work, he turned that into a store. Unfortunately, hard work alone wasn't enough to overcome beginner's fumbling, and Sam lost that business, but not his drive for success. So on the next go-round, in addition to hard work, he took the experience that he milled into business smarts, and opened another store, and the customers lined up. He also figured out one of the best ways to get true, unfiltered information about his own workers, and the competition, was to walk the line. Sam would hang out and drink coffee with the truckers who made the morning deliveries. Dressed like the working man he was at heart, people never knew he was their boss when he'd walk into one of his many stores and shop. He spent days talking with employees on the floor, searching for the hard-to-find items, chatting with the other customers up and down the aisles, trying the patience of the folks at the returns desk, and checking out at the registers he owned. From a headquarters Arkansas, Sam Walton crushed the competition that at first dismissed him as a hillbilly tooling around in his pickup truck with his hunting dogs riding shotgun, lapping at the breeze. But Sam Walton had selective hearing. He knew who to hear, and who to ignore. With his deaf ear trained on his critics, he re-made most of the concepts about the retail business in America. He went from an oddity who was marginalized by the so-called "experts" in business, to the icon cited as the model in most graduate business schools. In all ways, Sam Walton was the corporate equivalent of a muddy-boots General, like George S. Patton. Colonel David Hackworth, one of the most decorated—and controversial—military leaders in US history, offered nearly identical advice to military leaders. Hackworth said that to really know what's going on, you have to talk to the grunts. You have to walk the line. I came to Iraq to walk the line. Modesty demands that I qualify this by saying I am not placing myself on a level of greatness of any of these men. I just happen to follow that same principle. Here in Iraq, where so many things are so very different from the way they are reported in the mainstream media, I am actively guided by the advice of these men every step of the way. I did not come to Iraq with the intention of having someone tell me what the people on the "front lines" were thinking and feeling. I came to see with my own eyes. It's important to talk with Generals: they are all very smart or they wouldn't be Generals, but a General says what he wants people to hear, and sometimes they do lay it on pretty thick. I wanted to meet soldiers. Combat soldiers in particular. And combat soldiers before, during and after combat operations. That's the only place to figure out who is winning and losing this war. "Winning" meaning the Iraqis embrace and protect their freedom and most of our folks come home. Losing meaning something other than this, up to and including to any dreaded stasis. There are three main rank structures in the Army: Officers, Warrant Officers, and Enlisted (who become non-commissioned officers). The officers constitute, in a sense, "the management" and other "professional" functions such as doctors and pilots. All are university educated, many have advanced degrees. Warrant Officers are a small almost hybrid caste; educated, but never top ranking leaders, they tend to be specialists. The Warrant Officer "caste" is critical, but for practical purposes, it is reasonably accurate—at least for the present purposes—to say that the American military is managed by officers, but run by the enlisted soldiers, and augmented by the warrant officers. Enlisted soldiers, such as CSM Mellinger, might be characterized as the working class. And so, while top military officers must handle both political and military exigencies—read: office in Washington and in Baghdad—the top enlisted person will have the title of Command Sergeant Major, and will have gone through plenty of filters and fine screens to earn all the respect the title confers. 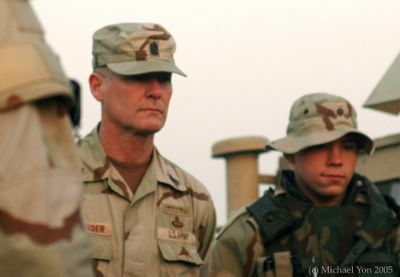 Four-star General George Casey, a very experienced officer and combat leader, is the commander of Multi-National Forces in Iraq. He's risen to a position where maintaining balance means fending for the troops with one arm, and dealing with political leaders with the other. General Casey was commissioned in 1970 and, two years later, CSM Mellinger came into the Army. These are two of the most senior men in the US military; in fact, CSM Mellinger is the most senior enlisted man in the Army today. He was drafted into the Army. Given that I came to Iraq to see what is really going on, the man I needed to meet was not a General, but CSM Mellinger. Over the course of the intervening six months after our impromptu meeting in front of the mess hall, I sometimes contacted CSM Mellinger, asking if I could ride around Iraq with him. He is known to tool around Iraq much like Sam Walton tooled around in his pickup, only CSM Mellinger traverses the incredibly treacherous roads in a Humvee. I contacted CSM Mellinger after successful Iraqi elections in January, figuring he might be in a good mood. The translation of his response was "no." Time went on, and I contacted him a few more times, always the same "no" embedded in his response. Finally, while I was eating lukewarm food on the hood a Humvee in Mosul, all of a sudden . . . grace my eyes . . . I looked over my shoulder and saw CSM Mellinger again. I wasted little time making a personal request, and after LTC Kurilla, who was also standing there, vouched for me, I got a "maybe." More emails and more "maybes," until the day came . . . about five days ago . . . when CSM Mellinger had driven just near Mosul to Tal Afar—in his Humvee for chrissakes—to check out his soldiers who were fighting in the area. He happened to be passing through Mosul on the way back to Baghdad, so, finally, after six months of asking, he allowed me to tag along. Sometime after getting that news, I learned that while I am the first "journalist" to travel with CSM Mellinger, I am not the first he invited. Two reporters to whom he extended similar invites around election time, both backed out when they realized they would be traveling in a Humvee. And so, he picked me up and we drove to Baghdad, and now we are headed to Kuwait. I've had six months to put a list of questions together. Some of his answers, along with my observations from "walking the line" with CSM Mellinger, will be included with subsequent posts. But for now, we are driving the roads of Iraq in a Humvee, and walking the line.